Niger River, is the godfather of the state of Niger, which is located in West Africa between the countries of Algeria and Libya, Burkina Faso and Mali, Chad, Nigeria and Benin. Territory is a 1 267 000 square kilometers, and the Niger River is a major source of population. It is the third largest river in Africa after the Nile and Congo rivers. In one of African languages -Tuareg, the name of the river, “ Egerew n-Igerewen” translates as "river of rivers". In Niger there are four major river systems: the Niger-Benue, Chad basin, Southwest and Southeast coastal, and border river system, used in conjunction with Cameroon. Surface water resources that flow to the ocean are estimated at about 236 cubic km/year. The flow of the River Niger is estimated at 30 cubic km. and of Benue and its tributaries, the amount of 29 cubic km. Renewable ground water resources of Nigeria are estimated at 87 cubic km. / year. The total capacity of the dam system of the country is equal to 30 cubic km. The construction of dams in Nigeria, for the most part started after the mid-seventies. Currently built are 60 large and 100 smaller dams. Niger River is the largest river, which flows in West Africa. Its length reaches 4160 km. Catchment area of the Niger is estimated at 2 117 700 square kilometers, the Niger River flows out of Sierra Leone (West Africa). Crosses the territories of Guinea, Mali, Niger, Benin and Nigeria and flows through a massive delta in the Gulf of Guinea. Because of the savanna climate, maximum water levels are during the summer during the rainy period, and low water - during the dry winter period. The waters of the Niger River are invigorating for the whole country. They are used for irrigation and navigation, and electricity, mainly downstream. 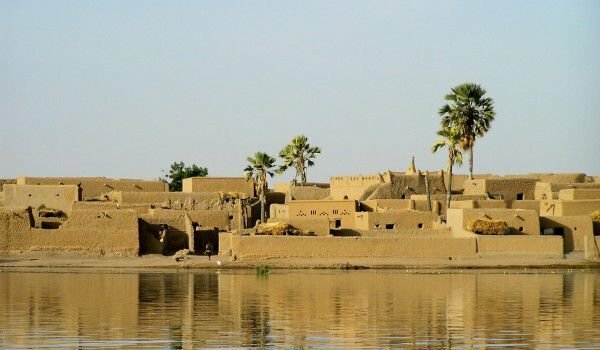 For centuries, the river is used for trade - as it carried containers filled with gold, spices and slaves who made it to Timbuktu, where they exchanged goods, carried by caravans across the desert. Even today, the Niger River is the beating heart of West Africa. In the past, one of the channels of the Niger reached all the way to Timbuktu, but today the nearest river port, Kuriema, is 25 km from the city. The huge river crosses Mali along the 1400 km path, and spills across the plain, separating the capital Bamako in two. In Bamako over River Niger pas three major bridges, that are usually clogged almost around the clock. Along the river in big cities you can see the rail fence, where fish is sold. The delta of Niger River, in the Gulf of Guinea, is one of the most polluted places on the river. 40 years of contamination by petroleum products is a fact, and a matter of dispute for decades. A team of 100 experts from the Environment Programme of the UN held a three-year investigation into the contamination levels of soil and air around the Niger delta. Project funds worth $ 10 million were paid by Shell. The final results reported that only 10% of oil pollution in Ogoniland was caused by equipment failures and negligence of the company. According to the conclusion the vast majority of pollution due to the theft of fuel from the local population and attacks on oil pipelines of the company. Experts believe that the solution to the problem of pollution of the River Niger to engage local authorities and not the UN. They stressed that pollution is serious, and oil companies should contribute to the purification of air and soil in the area.